Richcraft has announced a sales promotion to push the remaining units at The Bowery. The “Closeout Sale” offers a discount on all units, plus a free storage locker during the month of March. Specifically, units up to and including 6th floor will be discounted by $6,000. All units 7th floor & up will be discounted by $5,000. There are still great units available across most price points and sizes. Located at 255 Bay Street, The Bowery Condos + Lofts is 18 stories with 248 units ranging in size from 493sqft (S5 floorplan for $262,000) up to 781 sqft (T1 floorplan for $452,000) . Amazing rooftop amenities that are worth making the project a must-view. The Bowery is Richcraft Homes’ latest building, located at 255 Bay Street in Centretown. The building is now completed and there are only 40 units left in the building or 84% sold out. Prices for remaining units range from $262,000 up to over $472,000. Size of available units is from 493sqft to 846sqft. For more information about the Bowery, visit our Bowery page located HERE. For more information about new condos located in downtown Ottawa, fill out the form at the bottom of the page! Richcraft's latest development is coming later this year. Floor-plans and pricing are currently being sorted out, but sources are saying to expect a late summer/early fall launch. The development will be located in Sandy Hill, specifically 560 Rideau Street. Sales continue to move along at Richcraft's The Bowery Condos, which is located at 255 Bay Street. The building is now 75% sold out. Only a few select floorplans are available, and an almost immediate closing could be provided. 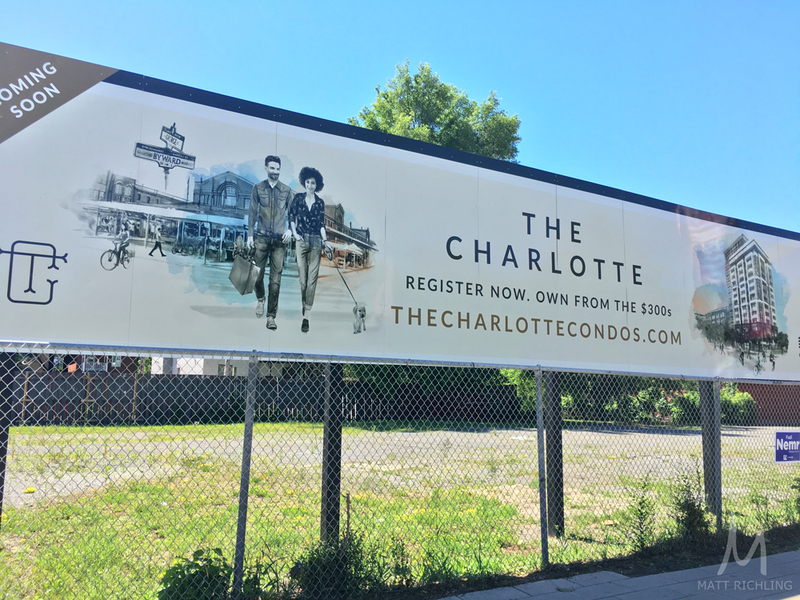 For more information about The Bowery, or condos in Ottawa, fill out the form below! The Bowery Condos and lofts, built by Richcraft Homes and located at 255 Bay Street, has sold 159 of the 246 suites (250 if you include the two guest suites, sales office, and the superintendents unit) or about 64% sold out. There are six of the floorplans that are fully sold out and numerous floor plans that are only available on lower floors. Pricing starts at $200,000 for the S2 model which is 401sqft, and only available on the 1st and 2nd floor. The largest unit that is currently available is the T3 model which is a two bedroom, 919sqft, located on the second floor for $418,000. All units include 4 European stainless steel appliances, washer and dryer in-unit, quartz counters, and hardwood flooring throughout the unit - all standard. The building is now complete and the units are available with an (almost) immediate closing period. Parking is available at $30,000* and lockers at $3,000. Monthly condo fees are priced at $0.36sqft and include heat, water, central air, etc. *Parking available for select units. For updated floorplans and price lists, fill out the form below. Richcraft Homes is currently pushing the last remaining units inside of the Galleria 2, located at the corner of Besserer and King Edward (on the border of Sandy Hill and the Byward Market). "The Million Dollar Event" has discounts on the remaining ten units, ranging from $40,000 to over $275,000 off of the purchase price. The building is now fully completed, allowing a quick closing period (for those who are looking to move fast). Building features an indoor pool, gym, amenities room and outdoor area, visitor parking, etc. A few of the available units include - The Urban Sp. on the 11th floor, 720sqft plus a large 435sqft terrace originally priced at $493,778, now priced at $399,000. The first major standout is the terrace, but looking closer you will see that the living area is decent and provides plenty of room depending on how you wish to enjoy the space. This includes underground parking, storage locker, stainless appliances, hardwood throughout including the bedroom, Granite counters throughout etc. Another favorite is the Fenton floorplan on the 6th floor, 978sqft two bedroom two bathroom that was originally listed at $487,000 and now priced at $447,000. A smaller sized corner unit that includes a master en-suite bathroom and lots of light. This includes underground parking, storage locker, stainless appliances, hardwood throughout including the bedroom, Granite counters throughout etc. Overall with the highly desired location (steps to Byward Market, Rideau Shopping Center, Nordstrom, Parliament Hill, University Of Ottawa, etc), and high-quality finishes, these units are certainly appealing to those currently shopping. There are only ten units - so once they sell, they are gone. If you are interested in downtown condos for sale in Ottawa, contact Matt Richling (sales representative with RE/MAX Hallmark Realty Group) who focuses on downtown living. Fill out the form below or email him directly - Matt@MattRichling.com. The Bowery, by Richcraft has come along way and is progressing nicely. Currently at the 15th of 18 floors, they are installing the exterior windows on the 6th floor. Richcraft is on track with occupancy to start on November 1st. Currently 98 units are sold in the building out of 246 units, with three sold so far this month. Richcraft raised The Bowery pricing yesterday after a comparison to other buildings in the area showed that they are still priced quite lower. The Bowery is located at 255 Bay st (at Gloucester) - with the sales centre located at 136 Bank ( at Slater). A total of 246 units with prices starting from $181,000. Rooftop amenities feature an indoor pool, fitness and yoga studio, indoor lounge/party room, outdoor terrace, sauna, etc. 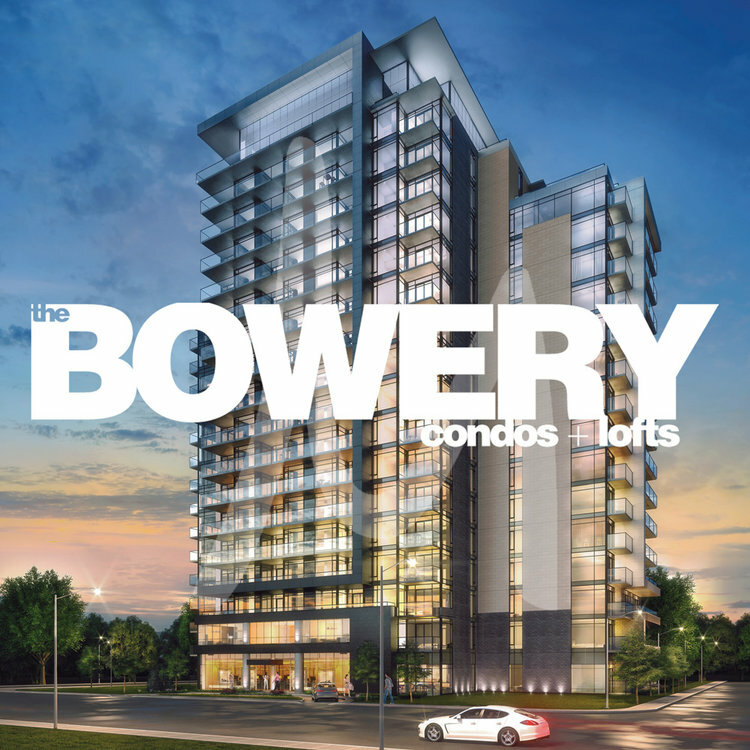 For more information about The Bowery, or pre-construction condos in Ottawa, Contact Me! Genworth and the Conference Board of Canada has released the 2015 winter edition of its apartment condominium study that looks at eight metropolitan areas, including Ottawa. For the full report and in depth look into Ottawa and the other areas, click here. "Although inventories remained high in 2014, Ottawa apartment building permits nearly doubled during the six months to December 2014 compared with their year-earlier levels. As a result, the new apartment condominium market is set to pick up again in 2015, with starts forecast to increase by 9.9 per cent. In fact, construction is already under way on a number of new buildings this year, including The Bowery condominiums and Claridge’s Icon condominiums in Little Italy. The Icon condominium building will be Ottawa’s tallest. But this title may not last long. A new development proposed by Richcraft Homes, also in the Little Italy neighbourhood, would see the construction of three new towers, the biggest of which would be 55 storeys tall. Starts are expected to keep rising from 2016 to 2019, growing by a forecast average of 1.2 per cent per year. Absorptions are set to decline this year and next, albeit from a 2014 record high, and then begin to rise through the next few years, helping to whittle down inventories." - taken from the report. Construction is underway at The Bowery Condos (255 Bay St) by Richcraft Group. Crane was delivered on site a short while back and crews are currently pouring the lowest parking level, P4. Currently sitting at just over 25% sold, with an expected occupancy date of late 2016 for the lowest floor to mid to late 2017 for the penthouses. Some of the units are now sold out completely (the S4 studio unit, penthouses), while some have limited availability (S1, S2, S3, O2, O3, F4) on the lowest floors. Question about The Bowery Condos? Richcraft Joins The Tallest Condo in Ottawa Battle! Next week Richcraft is going to be in front of the planning committee to get approval for the tallest condo building in Ottawa. The building will be located at 845 Carling, one of three buildings they are hoping to construct on the site which is the old Dow's Honda location. Currently approved and now under construction, Claridge's Icon holds (or will hold?!) the title for tallest condo building in Ottawa sitting at 45 storeys. Richcraft is hoping for a 55 storey(180 meters) building, along side a 45 storey (148 meters) and 18 storey (66 meters) sister towers, all containing approximately 1120 units, with 6,800 sq meters of ground floor commercial space. Currently the entire Carling/Preston area is zoned for 31 storeys, which was approved last summer. The main issue at this point seems to be over parking. Minimum parking for the complex is 675 residential spaces (91 commercial), however Richcraft is looking for an extra 100 spaces (766 in total plus the 91 commercial). The builder is also looking for an increase in bicycle parking spots to 566. Plus this complex will have direct access to the O-Train's Carling station, raising questions as to why the extra spots. What is a PDI or Pre-Delivery Inspection? When Do I Have To Pay The Deposit? What Is The Ten Day Cooling Off Period? What Is Interim Occupancy? And What Are These Fees? Banks Unsure of Micro Condos? What to expect on closing day in Ottawa for a first time buyer!? Any questions about pre-construction condos? I would love to chat! Which Ottawa Condos have Pools? 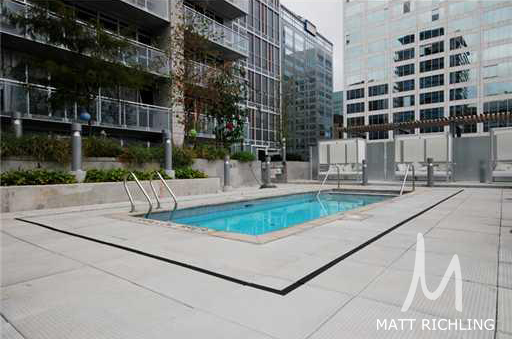 Lets look at which condo buildings around Ottawa have pools! Claridge (especially lately) has been a big believer in amenities and nice big pool areas. Take a look at Claridge Plaza (phase 1-4), La Tiffany (phase 1 and 2), Lebreton Flats (250 Lett), Tribeca (pool under construction), and eventually Claridge ICON (est 2018), etc. Urban Capital has started including resort styled pools with The Mondrian (324 Laurier) and the Hideaway (on Mcleod). 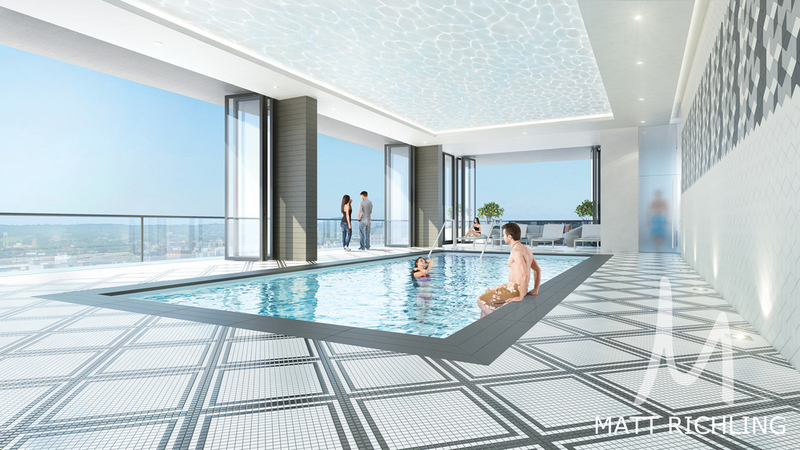 Mastercraft Starwood, known for high quality amenities includes pools at SOHO Lisgar (300 Lisgar) and soon SOHO Champange. SOHO Parkway only gets a rooftop hottub with some of the best views of the city... (sarcasm...). Richcraft has built a few pools including, The Galleria (200 Besserer), The Galleria Phase 2 (238 Besserer), The Laurier (570 Laurier), and soon to be built The Bowery. Other central buildings with pools include 90 George St, 160 George Street, 199 Kent, 500/530 Laurier Ave, 470 Laurier Ave, 556 Laurier Ave, 151 Bay, 20 The Driveway.... etc. The list goes on. Currently we have a few units available with pools including, Claridge Plaza (234 Rideau Unit 1005, Mondrian (324 Laurier Ave Unit 2209) and two units at Tribeca (179 Metcalfe)! 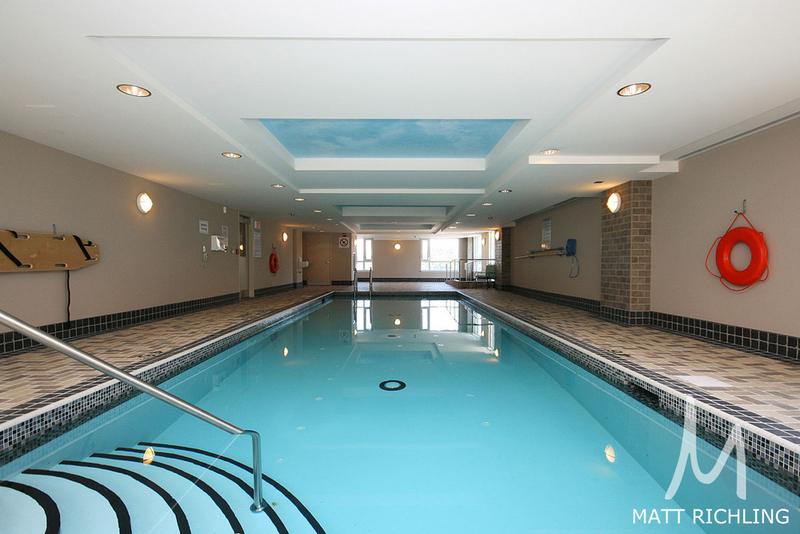 If you enjoy taking a dip and are looking for a condo with a pool in Ottawa, lets chat! I would love to help you out! Taken from a Richcraft promotional piece following the recent win. There has been lots of excitement over the past year, with much more competition between builders means more effort into marketing, sales, and design. The Sammy Awards are held by the Greater Ottawa Home Builders Association every year, for local builders and industry partners. Richcraft Homes was the big winner, taking home the Grand Sammy for most awards. They won Best Print Advertising for a Builder (The Bowery Condos), Best Builder Sales Centre (The Bowery Condos), Best Marketing Campaign (The Bowery Condos), and Best Builder Brochure (The Bowery Condos). Claridge Homes took home Best Condo Model for a High Rise (the Tribeca Broadway unit), Best Builder Website, and Best Town Home Model over 1,500sqft. Minto Communities also won with Best Project Logo, and Most Environmentally Friendly Builder. For a full list of winners, visit here. For more information on the Sammy's visit here. For the past few weeks Richcraft has been blasting away at the site for Bowery Condos, located at 255 Bay Street at Gloucester Street. Currently the building sits at 25% sold which is just about 60 units. Exciting to see things moving forward for the project. Here is a run through of the Bowery building I did when it first launched. So since the VIP agent party a few weeks back I have been getting tons of inquries for more information regarding The Bowery. If you don’t know about Richcraft’s newest building, CLICK HERE. Also… note the pricing… its pretty decent for what you will get. Especially compared to other buildings and launches going on right now. Add in the rooftop pool, gym and party room, free condo fees for a year and free storage locker! Its one of the hottest buildings we have right now. - First Choice and Best pricing through agent VIP Launch including no condo fees for a year. As standard, clients want to know what I think about certain floorplans… I will go over two floorplans and provide my thoughts. Here we have the B2 floorplan which is 520sqft plus the 162sqft balcony. Price is starting at $248,000 on the 1st floor which includes the free locker. There are two of these per floor, one facing north, and one facing south. It features a nice entry way including the front closet, washer/dryer and even a small built in desk. Then you have an open kitchen/living room area and decently sized bedroom. Here we have the B1 floorplan which is 590sqft plus the 96sqft balcony. Price is starting at $274,000 on the 1st floor and available up to the 15th floor. There are two of these units per floor with both having eastern AND a second exposure East or west (depending on the unit). Thats right, this is a corner unit that offers plenty of natural light. Again you have a nice entry way, which separates the unit from the hallway, however there is no desk area. The bedroom is smaller, but has eastern facing windows. The kitchen/living room is slightly larger than the B2, but has a slightly smaller balcony. Both of these units are a favourite of mine for someone looking for a one bed under $300,000 and both of these could even include parking under that $300,000 budget too (depending on the floor height). Which IMO is a great buy. If you interested in the full floorplans, and pricing please shoot me an email - Matt@MattRichling.com. Keep in mind that they have now announced the VIP agent launch date for November 7th, which will allow clients working with agents the first chance of purchasing a unit in the building. If you would like to have me walk you through your options, negotiate the deposit structure, and assist with purchase, feel free to contact me. Ask about the incentives that we offer, over and above the 1% lower purchase price and free condo fee’s for one year. You can always email me - Matt@Mattrichling.com - or by phone 613-286-9501. Located at 255 Bay st, Ottawa builder Richcraft is about to launch its newest project called The Bowery. The same builder to bring well crafted and high quality work such as Galleria and Galleria phase 2. Last week, Richcraft invited me to a sneak peek to show me the project and give me the full scoop on what is coming. Located steps from Bank St. the Bowery is going to be a 17 floor building with a rooftop pool, terrace and hotel inspired amenities. Units start at 375sqft up to 914sqft. Obviously slightly smaller units, with prices that are reflective of the size, starting at $179,000 up to $415,000. Montly condo fees at priced at $0.38 per sqft. Best part is every unit includes a storage locker at no extra charge. There are some amazing amenities in the Bowery over and above the rooftop pool and terrace, including the gym, sauna, outdoor yoga studio, party room with fully equipped catering kitchen and private dining room, hotel inspired lobby including concierge and guest suite. The building launch is set for late October or Early November (date still coming), for VIP clients and shortly after for general public. To get more information including prices, floorplans and other information, contact me directly at 613-286-9501 or Matt@MattRichling.com. Stay tuned as I will profile some of my favorite units, and walk through the floorplans. This is a very exciting building which you do not want to miss.